It’s that time of year again! We are gearing up for the Fishing Derby at Punderson State Park. Please read the below details for more information. Registration will be required online again due to needing detailed information for state records. COST: FREE, Donations made to The Friends of Punderson are greatly appreciated. 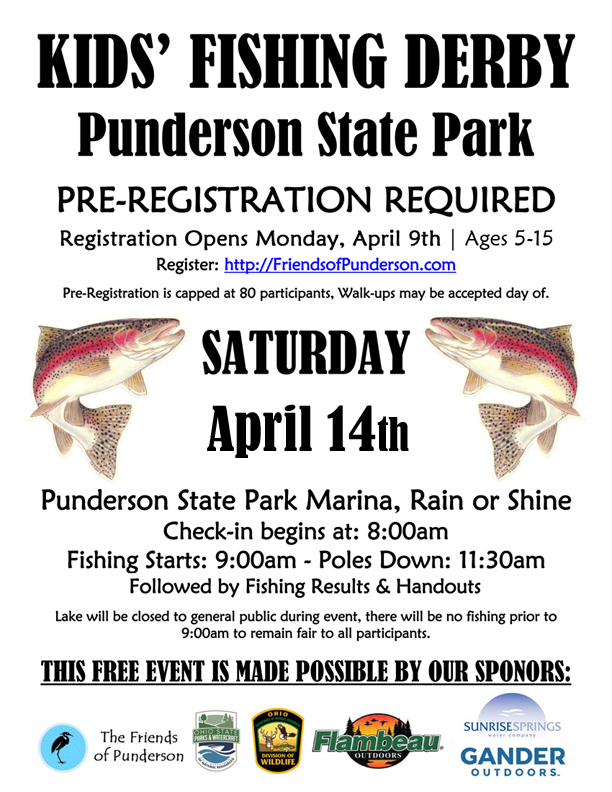 Event Description: This event is held in concurrence with the fish stocking at Punderson State Park. The intentions of this event are to get children interested in fishing and be a positive learning experience for those who attend. Eligible Participants: Children Ages 5-15 at the time of the event. This event is intended to be a non-competitive event. Children will not be given any special award for catching fish, however all registered participants will receive a giveaway at the end of the event provided there is enough for everyone (this depends on donations). Registering for the event does not guarantee your child will receive anything, your child must attend the event and participate to be eligible. WEATHER: Rain, Shine, Sleet or Snow Event! Please dress appropriately and come prepared. FISHING: Children do not have to fish at the marina, this is generally the best area for everyone. However, children may also fish down by the campground dock. ANY FISH is acceptable to bring in to be measured, it does not have to be a trout.